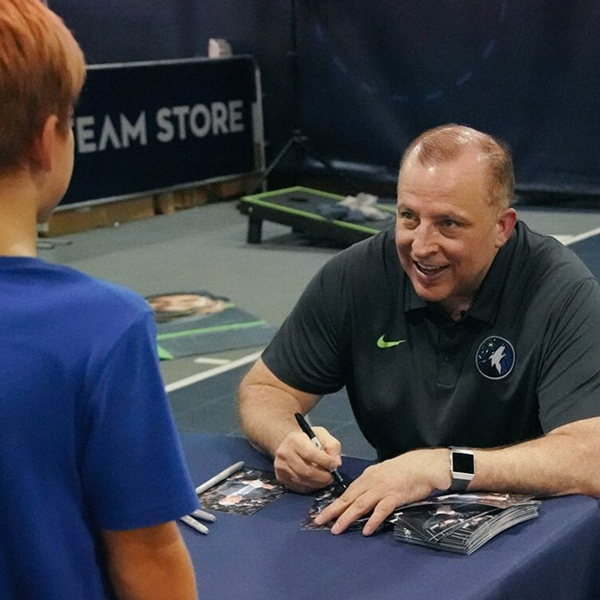 Timberwolves President of Basketball Operations and Head Coach Tom Thibodeau made his annual trip to the Minnesota State Fair on Monday afternoon. He chatted with Jerry Zgoda, who is no longer on the Wolves beat (we’ll miss you, Jerry! ), at the Star Tribune stand. He took pictures with fans (and a Loon), while also signing autographs. He signed a Kentucky basketball. FYI: Thibodeau did not attend Kentucky, although Karl-Anthony Towns did. Thibs had a mini media tour, chatting with WCCO Radio, 1500 ESPN, and KFAN. We’ll check back in to see if Thibs grabbed any Sweet Martha cookies.